Still working the scanner like a fiend, trying to post photos in chronological order (but we'll see how long that lasts). 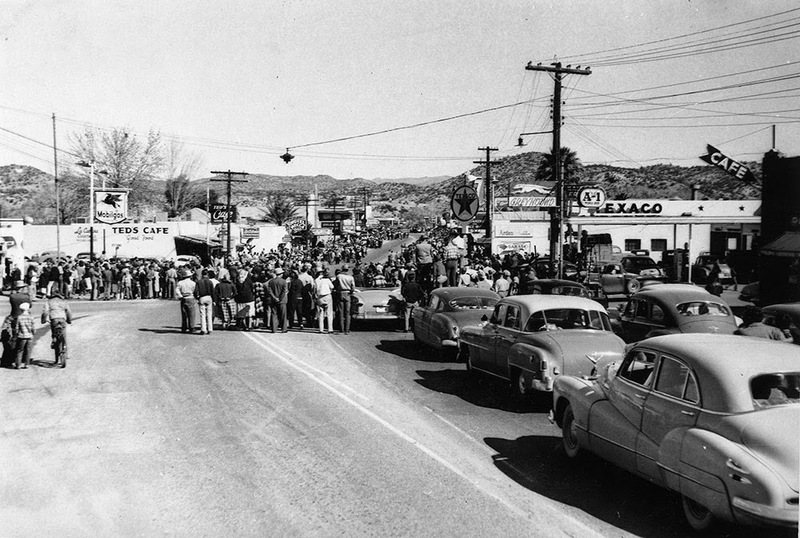 This gallery is in a similar time and place, 1951-1956 in Arizona. This is an event held annually in Wickenburg AZ (small community about 60-odd miles out of Phoenix) called "Gold Rush Days." It's very cowboy-themed! See the video below (video not mine) shot in 1958... as close to it as I have found. I love seeing all these folks decked out in their 50s best (I think it will enlarge if clicked), and the rest of the shots of cowboys and cheesy floats. In other news, the weather is FINALLY cooling off, still warm enough to call summer up further north, but feeling less like an oven. We spent Tuesday night of this week attending the Austin City Limits TV taping of Neko Case - who has a haunting voice like no other. She spent some time in Tucson AZ herself (recording an album), her father was in the Air Force (like mine), and told the story during the show of have a stuffed iguana as a kid - not a plush toy but a real dead iguana with painted teeth, stuffed with cotton and (I'm sure) wires... this was funny to hear for me because when I was a kid I had a similar companion -- a stuffed baby alligator (or possibly a crocodile) named Kilroy. Parents can make strange choices sometimes. The 1950s were weird and wonderful in their own twisted way. I miss the 50's..so your a brat..there are several sites on facebook for brats..I love it..we all have so much in common and it's like a big family there.